For over 50 years, Kilmeanden has honoured one very important promise: to 'select the best and do away with the rest'. 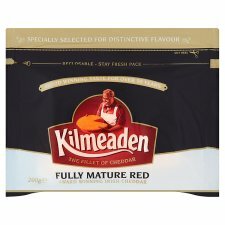 It's what makes Kilmeanden the 'Fillet of Cheddar'. As the resident Master Grader (yes, that handsome chap in the apron is me) experience tells me that cheese, like most of the finer things in life, naturally improves with maturity. That's why we let our cheddar slowly mature for many months. Taste Kilmeanden and discover for yourself our famous award winning craft and flavour. Use within 7 days of opening and by Best Before date.